For the third fall in a row, the major division championship turns into a showdown between the Platoon and the CBA Tigers. In the visiting dugout, fresh off a championship 3 days ealier in the midweek division, you have the CBA Tigers. In the home dugout, you get the 3-time defending champion Platoon, who led the league with the most runs scored, and the least runs allowed. With two dominant 8-1 teams, this series had the makings of heavyweight bout. With the smoke mostly cleared from the recent wildfires, but command crews still set up across the parking lot, Spring 2018 Cy Young award winner Ryan Brockett took the mound for Platoon. He worked around a walk in the second to put up a few zeroes. For the Tigers, Fall 2018 Cy Young award winner Carlos De Santiago matched the effort, and the score was tied 0-0 after 2. Jerry Zaragosa led off the top of the 3rd with a home run to put the Tigers on the board. 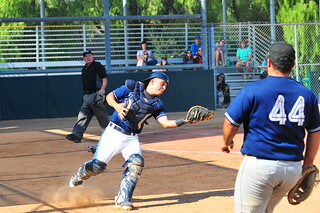 One out later, Jaime Dorado singled and moved into scoring position, and Niko Garcia singled him home. Nick Kaid walked, and Justin Kaid singled home two more. With a big inning, the Tigers found themselves up 4-0. Fast forward to the bottom of the 4th. 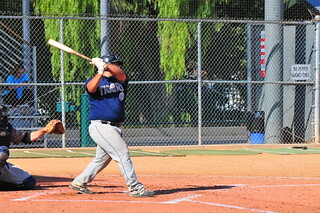 With one out, Platoon's Sal D'Angelo was hit by a pitch, and moved into scoring position on a Jimmy Lloyd single. Back-to-back singles by Steve McGrath and Gio Mazzola plated 2, and the Platoon trailed 4-2 after 4. 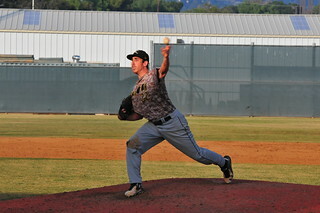 With the momentum in Platoon's favor, Eddie Knipps doubled with one out in the bottom of the 5th. Tim LeSuer singled him home, and with 2 outs, Sal D'Angelo doubled home LeSuer to tie the game at 4. The Tigers came right back in the top of the 6th. Brothers Nick and Justin Kaid led off with back-to-back singles, and with one out, Carlos Ochoa walked to load the bases. Robert De Santiago cashed them in with a 3-run double, giving the Tigers a 7-4 lead. Back came the Platoon in the bottom of the 6th. Steve McGrath singled, and eventually came around to score to cut the lead to 7-5. Both teams turned to their bullpens in the late innings. 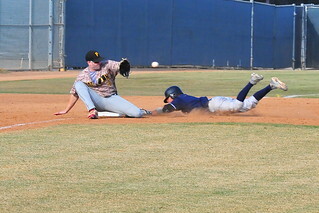 Platoon's Jeff Bezian surrendered a run in the 8th on a Justin Kaid single and a Robert De Santiago double. In the bottom of the inning, Tiger's Danny Pimienta surrendered a run on two walks and a Bezian sac fly. But that would be all the scoring on the day, and the Tigers held on for an 8-6 victory. 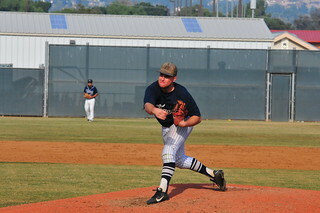 Serrana pitched 4 scoreless frames, including getting in and out of trouble in the second. After surrendering a 1-out single to Steve McGrath and a double to Jeff Bezjian, he induced a pop-up and a strike out to escape the jam. He turned the ball over to Victory Banuelos in the 5th, who worked out of a bases-loaded jam to keep the Platoon off the board. Meanwhile, Mercer looked every bit the ace he is, giving up only one hit through 5. With the score still knotted at 0 heading into the 6th, the Platoon bats were about to heat up. With 2 outs, Steve McGrath doubled, and Jeff Bezjian singled him home. Ryan Brockett singled home Bezjian, and Nick Schmidt singled home Brockett, giving the Platoon a 3-0 lead. Mercer finally allowed a few baserunners in the 6th, on a walk and hit by pitch, but still led 3-0 into the 7th. The top of the 7th featured more Platoon offense. Tim LeSuer singled to lead off the inning, and Chad Avena doubled him home. 2 outs later, Steve McGrath reached on an error, plating Avena, and Jeff Bezjian singled him home, giving Platoon a 6-0 lead. With 1 out in the bottom of the 7th, Justin Kaid reached on a single, but Mercer quickly squashed the rally, giving the Platoon bats another opportunity to mash. Pinch hitter Gio Mazzola led off with a single. Tim LeSuer walked, and Chad Avena singled home one. Sal D'Angelo singled home another, and after Steve McGrath walked, Jeff Bezjian notched his 5th hit of the game - a 2-run double to give the Platoon a 10-0 lead. Obviously, that was more than enough for Zach Mercer, as he cruised through the final 2 innings to cap off a complete-game 4-hit shutout, and taking the series to a winner-clinch-all game 3! Nothing is more exciting than one game deciding a season. Would Platoon break the Tigers' hearts for the 3rd year in a row, or would this be the season the Tigers finally broke through with their first major division championship? Platoon sent Tyler Patton to the mound to face off with the Tigers' Nick Kaid. Niko Garcia led off the first with a walk, and moved to second on Justin Kaid's one out single. After both runners moved up on a passed ball, Bill McGrath skied a fly ball deep to right to bring home Garcia and give the Tigers a 1-0 lead. Tim LeSuer led off the bottom of the first with a moon-shot home run to right, tying things up at 1. Steve McGrath nearly followed suit 2 batters later, but his ball found the left fielder's glove JUST in front of the wall to end the inning. The Tigers responded quickly. Jerry Zaragosa singled to start the 2nd, and Robert De Santiago was hit by a pitch. 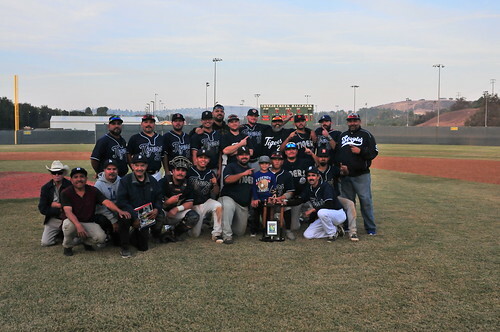 Tony Cabrera laid down a sac bunt to move both runners up, and Jaime Dorado walked to load the bases. 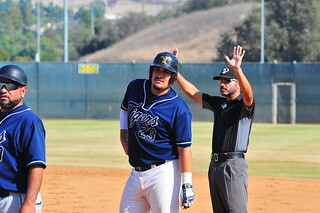 Angel Vega singled home a pair, and with 2 outs, Carlos Ochoa Singled home another, taking a 4-1 lead and chasing Patton. Sal D'Angelo relieved and got out of the inning. But the Tigers' bats were only getting started. Bill McGrath reached on an infield single to lead off the 3rd, and JC Barker followed with a single to right. Jerry Zaragoas walked to load the bases, and Tony Cabrera singled to right to bring home one. D'Angelo worked out of the bases-loaded/1-out jam, but the Tigers extended their lead to 5-1. The Platoon bats finally woke up in the bottom of the frame. 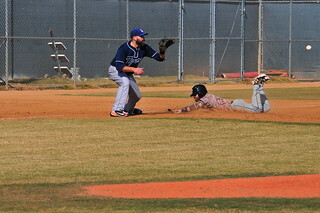 With one out, Tim LeSuer singled and stole second. Sal D'Angelo walked, and both runners moved up on a wild pitch. 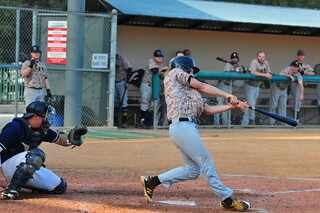 Steve McGrath cashed them in with a 2-run single to left, and the Platoon cut the lead to 5-3. Back come the Tigers in the top of the 4th. With 1 out, Carlos Ochoa walked and Justin Kaid singled to deep right center. Bill McGrath grounded out to bring home one, and JC Barker muscled a 2-out broken bat single just over the shortstop's head to plate Kaid, taking a 7-3 lead. Again, the Platoon had an answer. 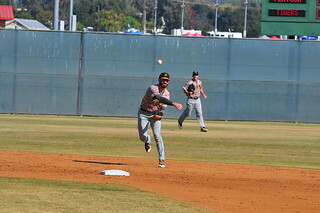 Game 2 star Jeff Bezjian singled to center, and after Ryan Brockett worked a 7-pitch walk, Gio Mazzola reached on a sac bunt/fielder's choice that loaded the bases with no outs. But all the Platoon could muster was a Tim LeSuer sacrifice fly, as the Nick Kaid and the Tigers escaped a big inning, still leading 7-4. 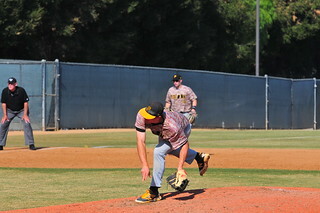 Game 1 starter Ryan Brockett entered the game for the Platoon, and that was the last we saw of the Tiger's offense. Brockett worked the remaining 5 innings, allowing one hit on 52 uber-efficient pitches. Meanwhile, the Platoon continued to work to get back into the game. In the bottom of the 6th, Jeff Bezjian doubled to right to lead off the inning, chasing Kaid from the game. Danny Pimienta came in and allowed an rbi-single to Brockett, cutting the lead to 7-5 before getting out of the inning. In the bottom of the 7th, the Platoon saw their best chance to take control of the game. Tim LeSuer led off with a rocket to the right-centerfield gap for a triple. Chad Avena walked, but Sal D'Angelo grounded into a fielder's choice to third, where LeSuer had to hold. Steve McGrath was issued an intentional pass to load the bases, but Pimienta settled down and struck out the next 2 batters to end the threat and swing the momentum back the Tigers' way. After a quiet 8th, the Platoon had their backs against the wall in the bottom of the 9th. After 2 quick outs, Sal D'Angelo walked to bring up the tying run. But Pimienta got ahead early, then blew a high fastball by the Platoon's clean-up hitter to cement the victory. I know I speak for everyone in attendance when I say, "What an amazing series!" Both teams played well, and hat's off to the Platoon for fighting to the last out. But this was the year of the Tiger, and with their second champagne bath in 4 days, we congratulate them for their first major division championship! 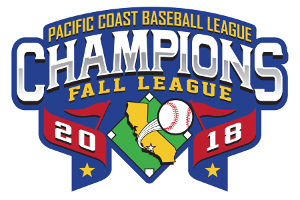 Congratulations to the Fall 2018 Major Division Champion CBA Tigers!